Students explore and analyze familiar heroes and villains, develop their own superhero, and introduce this new hero to the world through an ID card and comic. Superheroes dominate the silver screen, comics, and cartoons. Children (and even some adults!) enjoy dressing up as their favorite superheroes for Halloween, comic conventions, and role playing. Now it’s time for your students to design their own comic superhero! What powers will they have? How will they acquire them? Do they have a weakness? Many students are passionate about comics, so before you begin this project, ask students to bring in comics they are willing to share with the class. Kick off the project by asking your students to share some of their favorite superheroes. Create a list of superheroes and then add a second column to list their powers. Ask students to elaborate on how a character got their powers. For instance, Spider-Man got his powers from a radioactive spider bit, while Hawkeye uses his skills as a master archer. This is the type of information that is important back story when a comic hero is introduced. Bring up characters like Batman, Green Arrow, and Hawkeye if your students don’t mention them. These heroes do not have super powers, but are they still superheroes? Can tools, weapons, or even just intelligence and physical ability be enough to be considered a superpower? You may also want to share Buddy or Syndrome from the recent Pixar film The Incredibles. Add another column to your list and work together to identify each superhero’s weakness. Are the weaknesses from an object, like kryptonite, or from something else? Does every superhero have a weakness? Ask your students why this might be. Creators of superheroes often look to mythology for inspiration. Take Thor and Hercules, for example. While not as direct, ask your students to identify the powers of other gods, goddesses, and other mythical beings in the list you have created. After the discussion, or as homework, have students to write a short paragraph about which of the listed superheroes they would like to be and why. Choose a few student responses to read anonymously, and ask the class to discuss the pros and cons of each answer. Tell your students that they are going to become superhero and comic designers. Give them the list of existing heroes the class created, as well as time to reflect and do some additional research before designing their own superhero. Writing a complete comic book from scratch takes time, so you may want to group students together in small teams. Use an idea cluster or character traits organizer (Activities>Language Arts>Literature) to help students get started identifying the traits of their hero. Share a link to the Periodic Table of Super Powers to help them find more ideas. Encourage them to begin collecting and drawing details to a blank page they add to their character traits organizer that will inspire ideas as they design what their character looks like. When students are starting to get a general idea of traits, have them begin filling in the details on the Super Hero ID Card activity. Students can use the paint tools to draw picture of their superhero’s costume and special features and abilities in the image area of the ID card template. Have students introduce their superhero to a partner or different team, discuss the possibilities, and take notes on new ideas. Have them return to their superhero ID card, make edits, and finalize the details. Have students select the final image of their superhero using the selection tools on the Paint panel. Copy and paste the selection onto a new page. Then, go to the Options panel and choose Convert to Sticker. This will make it easy to copy and paste into various scenes of the comic if they do not wish to draw the character for each frame. Comics depend on a combination of simple scenes and dialogue to tell a story. The limited amount of space in a comic’s panels requires students to choose the most significant points in a text or story. Distribute printed storyboards for students to use to map out the action in each panel, or provide index cards or Sticky notes they can use for the same purpose. Comic artists depend on the setting and use of special effects to help convey meaning and feelings. As the students begin to see their comics take shape, ask them how many panels they think a comic needs to tell a story. Does quality depend on length? If not, can they establish a minimum number of pages? A maximum? Discuss and come to a consensus on guidelines for the final project. Distribute comic templates or use programs like Pixie and Wixie that include the ability to print multiple pages of a project as panels on a single page. Be sure to adjust the orientation of the project from landscape to portrait so that it prints like the comics they are familiar with. Pixie and Wixie include a Stickers library and paint tools students can use to design the scenery and characters. There is even a Cartoon library filled with characters, splats, and pows. Students can copy and paste the hero from their ID card or use the paint tools to draw the hero in different positions on each panel. Once a text object is added to a page, simply choose the Bubble option to convert it into a conversation or thought bubble. Did I introduce my character clearly? Is my hero’s motivation clear? Does the scenery help tell the story? Students should also create a separate cover document that includes the title and scene from the story, as well as their name as the author/illustrator/designer. When the pages of the story are complete, print the project so that 4 or 6 pages show as panels on a single sheet. Bind the printed sheets together with the cover to share in class or in the school library. You can also export the project as a PDF. 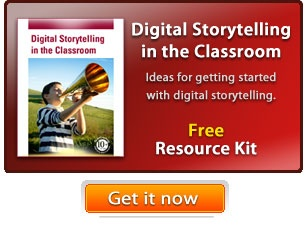 Collect the final printed versions into a classroom or media center display or collect the digital versions into a collection on your school or classroom website or even on iTunesU! Celebrate with an author signing or reading event. You can even host your own comic convention, where students can dress up as their hero and read their comic to younger students. Use what you learn about student experience with comics to help you translate their passion into analytical thinking. You can also evaluate analytical and creative thinking as they develop their superhero. Assess comprehension about a character’s motivation and the use of dialogue to create comics. Use the character traits and character/setting/events organizer as check points to evaluate progress and understanding. As students are storyboarding, writing the script, and translating it into visual panels and concise dialogue, ask 5 W’s questions and 5 senses questions to help them develop the story. As students begin illustrating their projects in Pixie or Wixie, prompt them with questions about their story to encourage them to add more details and create more complete, specific illustrations. a.	Orient the reader by establishing a situation and introducing a narrator and/or characters; organize an event sequence that unfolds naturally. b. Use dialogue and description to develop experiences and events or show the responses of characters to situations. c.	Use a variety of transitional words and phrases to manage the sequence of events. d.	Use concrete words and phrases and sensory details to convey experiences and events precisely. e.	Provide a conclusion that follows from the narrated experiences or events.